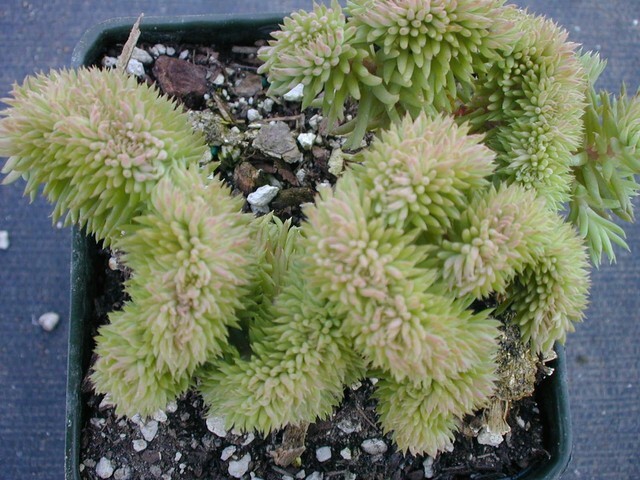 Many moons ago I was growing Sedum reflexum 'Cristatum' (Now correctly known as S. rupestre 'Cristatum') at the nursery when I decided to propagate and grow some of the ordinary material that comes when the plant reverts. I grew hundreds of the ordinary looking green reverts for about 3 years when one decided to fasciate, only this time the 'crests' were much smaller and tighter with a little more blue-green coloration. I decided to put my name on the decidedly 'brainy' looking plant and sedum Wayne's Brain was born.